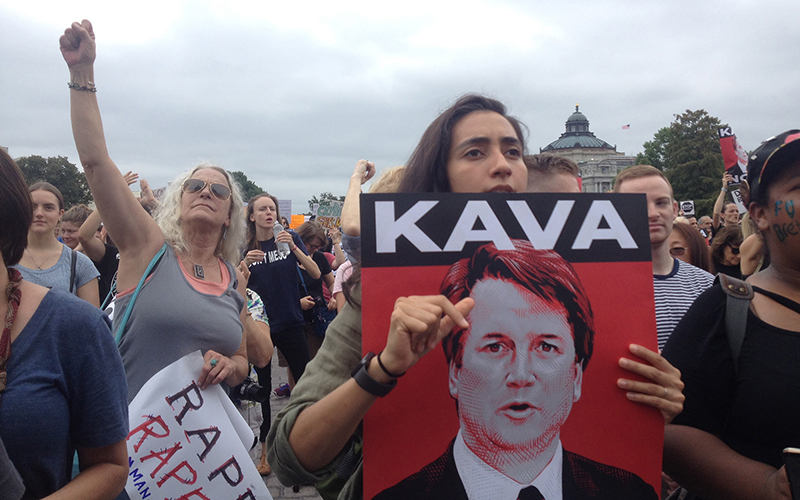 Protests against the confirmation of Brett Kavanaugh to become a Justice of the Supreme Court resumed on Thursday, October 4, and continued through Saturday. While still mostly women, more young women were seen than in September, dropping the average age of the protesters by at least 15 years. When these protests were planned, it wasn’t clear that the anything official would happen on October 4, and indeed it didn’t. Thursday’s protests captured the Kavanaugh news cycle, though it was shared with the release a day earlier than expected of the FBI report on what Kavanaugh allegedly did while young. The thousands of people coming to DC were told to rally at the federal courthouse where Brett Kavanaugh was then a judge on the DC Circuit Court of Appeals — considered to be the most important of the 13 Circuit Courts. However, when hundreds showed up for the standard pre-protest training at a nearby hotel, they were told that the real action would be on the steps on the east front of the U.S. Capitol. Shouting "Sexual Predators on the Court, Hell no, We Don’t Support," they role-played getting arrested and discussed how much resistance or non-cooperation to offer. In September’s protests, arrestees had co-operated with the police, getting up when asked and going where led. Scheduled for 12:30 p.m., the rally at the federal courthouse didn’t last long. Thousands of people began to march toward and around the Capitol while DC police blocked streets. However, when they made the turn on First St. NE around 1:30 they weren’t led up the path to the Capitol. Instead, they gathered in front of the Supreme Court steps where they had rallied many times during September. The Supreme Court police stood at the top of those steps to make sure that no protestors ascended them. For an hour protestors listened to speakers that they could not see, who were on the same level as the audience and surrounded by people. They perspired in 90-degree heat and humidity or huddled in what little shade there was across the street on the Capitol grounds. They cheered when told that Sen. Heidi Heitkamp (D-ND) had announced her opposition to Kavanaugh’s confirmation. She was one of two Democrats running for re-election in red states whose vote was uncertain. At 2:30 the crowd was told that the Capitol cops had barricaded the Capitol steps to keep protestors from occupying them. They were told to go to Hart atrium instead. An hour later a fraction of those thousands had gone through the security screeners. The cops told them to roll up their signs and banners so they weren’t visible as they were brought inside. Those with more solid signs that couldn’t be "hidden" had to leave them outside. While most gathered in the atrium, others visited Senator’s offices and many simply left. Women flown in from Maine and Alaska visited the offices of Republican Sens. Susan Collins and Lisa Murkowski, whose votes would decide whether Kavanaugh would be confirmed. The women in the Hart atrium became more and more raucous. Along with a few men, they chanted loudly, waved signs and banners and generally made enough noise to disturb anyone trying to work. Hundreds of police slowly gathered. They gave the requisite three warnings to leave if protesters didn’t want to be arrested, but let those who stayed to protest for about 15-20 minutes before beginning the removal process. Others retreated to the many balconies facing the Hart atrium where they watched the action below. Some held signs or dropped banners from those balconies which were generally ignored by the cops. 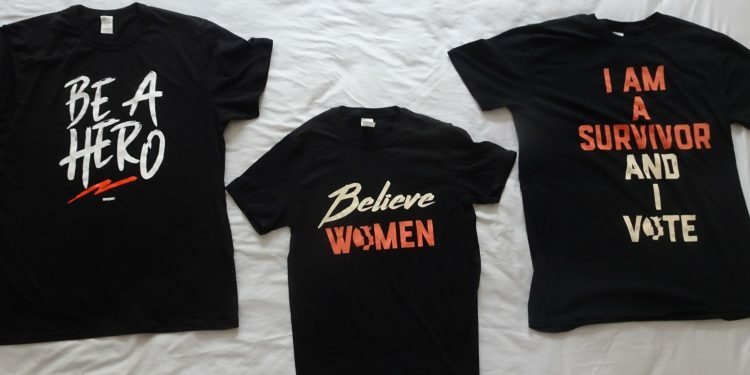 Several offices, probably of Democratic Senators, also displayed signs in their windows saying such things as "We Believe Survivors" and "Kava NO." Due to the many arrests the preceding month, the cops had almost run out of white, plastic handcuffs. Instead, they attached colored wristbands to one wrist, with the arresting officer’s number written on them. That way that officer could be identified if any of the protestors actually went to court — which was unlikely. Because one arm was free, arrestees raised their fist as they were escorted to the back entrance of Hart and out the door. Sheer numbers precluded transport to the regular processing centers. As was done on September 4, prisoners were led to the upper Senate Park where they sat on the grass until the time came for their charge to be written up. They had 15 days to bring exactly $50 cash bail to the USCP building across the street. Once paid, the bail was forfeited, and they were free to go. While some had to take chartered buses back to NYC, Philadelphia and other places, many came back on Friday for more protesting. Senate leaders had scheduled a vote on a motion to end the debate for 10:30 on Friday morning. If passed, the Senate would have 30 hours in which to vote to confirm Kavanaugh to be a Justice on the Supreme Court, or not. At that hour Minority Leader Chuck Schumer (D-NY) and Majority Leader Mitch McConnell (R-KY) both gave speeches stating their positions before calling the roll. The count was 51-49 to end debate. Of the four undecided Senators, both the Republicans and the Democrats split, with Lisa Murkowski (R-AK) and Joe Manchin (D-WV) not voting with their party. Pretty much everyone who could find a Senate office to sit in was watching the speeches and the vote. (I was in Chuck Schumer’s office). As soon as the result was announced a cheer went up from Hart atrium. Of course, it was the 'pros' who won, not the 'antis' who had been hanging out in the Hart atrium for most of the last month. Indeed a group of 'pros' had congregated in one corner of the atrium for a photo-op, displaying signs. This was an arrestable offense, but they weren’t there long and the cops left them alone. Most of the 'pros' were now wearing white T-shirts, which made them easier to distinguish from the 'antis', who were still favoring black.